I could have stayed in our deluxe suite a few more hours had we not needed to leave the Hampton Inn early to beat all the teenage concert goers to breakfast. 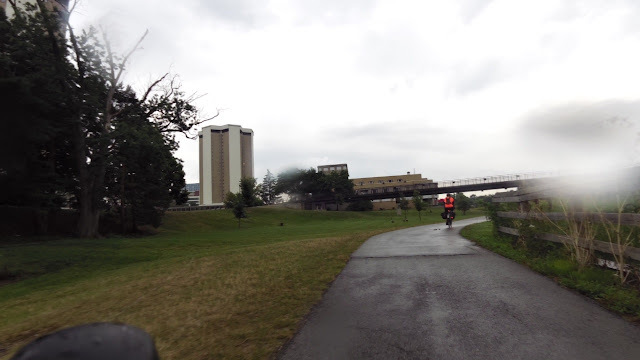 Through pouring rain, we picked up the Olentangy River Trail across the street from the hotel. 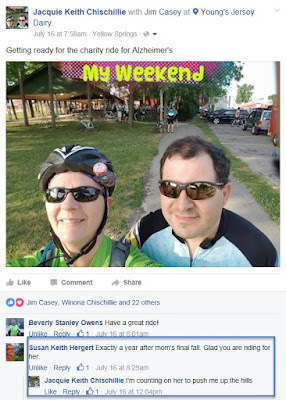 Let me start by saying the twisted web of trails in and around Columbus were more than a little confusing. The Olantangy Trail meanders through Ohio State University campus. 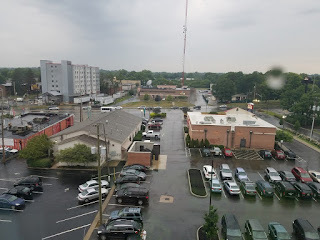 It runs on both sides of the street and, through the driving rain and heavy traffic, we had a little problem finding the right place to cross the street to continue on the trail. The campus was relatively deserted on this wet July day so we couldn’t even find a wandering resource to ask directions. Thus started our day of u-turns, course corrections, and urban adventures. 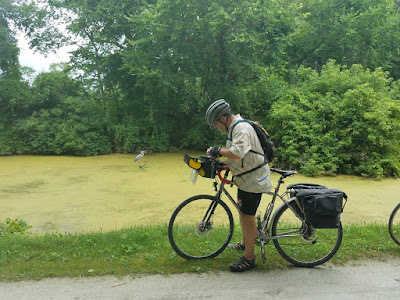 About 5 soggy miles later we jumped over to the Scioto Trail. What should have been a short 4-mile ride to the Hilltop Connector ended up being about 7 miles after we made two wrong turns and doubled back each time. We finally cried uncle and went into a corner convenient store for guidance. By this time, we were soaked to the bone and the clerk was not happy with the two unfortunate puddles we left on the floor. Despite the copious amount of drippage, the clerk was helpful. Two miles of short jaunts and numerous turns through a residential area dumped us out onto W. Broad St., aka US40, aka a heavily travelled highway running through the middle of Columbus, the Capitol of Ohio. What do you know?! We missed our turn again, doubled back once more and got off of the busy highway onto Norton Rd. 3.5 more miles of residential roads led us into Galloway where we picked up the Camp Chase Trail. The rain had finally let up and we even saw a glimmer of sunlight here and there. The sun helped bring optimism to our route finding and navigation. both getting hungrier and hungrier. We did see a grocery store sign over the hill. Our decision to go out of the way in search of nourishment was in vein. The gaping windows, vacant of any glass, ridiculed our suffering. 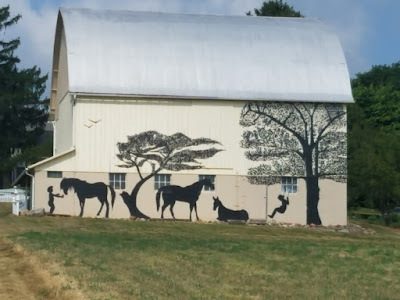 The rural country side was a welcome change from the congestion of Broad Street. Back on the Camp Chase Trail for another 5.5 mils of corn and RR tankers. By this time, we were ravenous and there was nowhere to eat in sight. We settled for Cliff Bars on the steps of the church in Lilly Chapel. That is about all there is in Lilly Chapel – a church and a four-way stop. Camp Chase becomes the Roberts Pass Trail after it crosses Wilson Rd. in Lilly Chapel. Roberts Pass runs about seven miles into London, OH. It was past lunchtime and we met Pedal Pal and Roomie in London for a bite to eat. We chose a little pizza joint called Ronettie’s because there was another loaded bicycle setting by the front door. It did not disappoint. The hoagies were delicious. Dale “Peace” Walker was the owner of the lone bike. He was a loner himself and had been travelling around the country on two wheels for the better part of a year. He came over to chat with us for a few minutes, wished us peace, and then asked if we could buy his lunch. Velo and I parted ways with Pedal and Roomie. This was their destination for the night. They were staying at a motel/trailer park called The Cordle Motel. If you go they accept cash or check only. 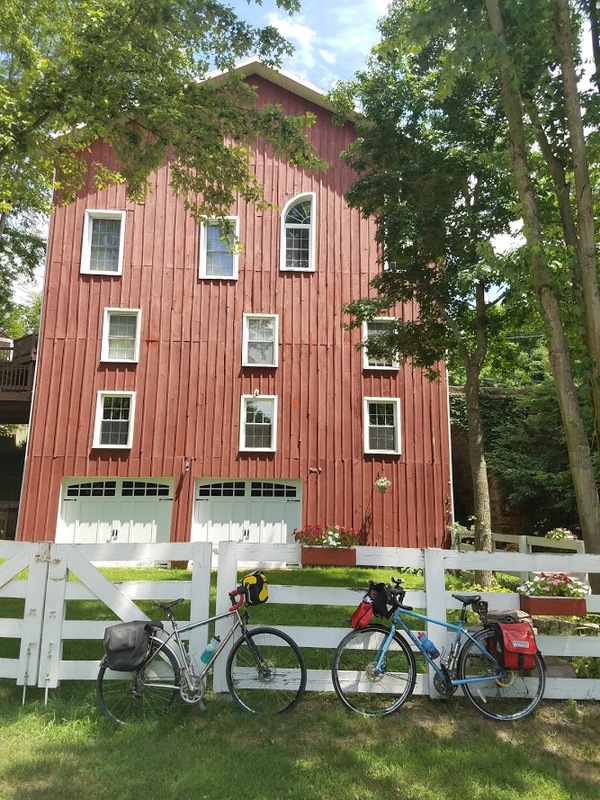 On the other side of London Velo and I picked up the Prairie Grass Trail for a 22-mile straight shot to Cedarville and the Hearthstone Inn for a total of 58 miles. 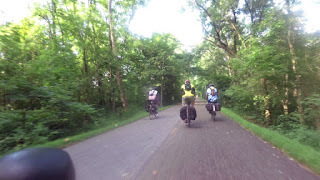 The only excitement we had on the this stretch was the family of wild turkeys we came across. Velo was unaware that I as trying to slow down and film them and barreled right on through causing the little family to take off in all directions. See the short video at 50% speed. 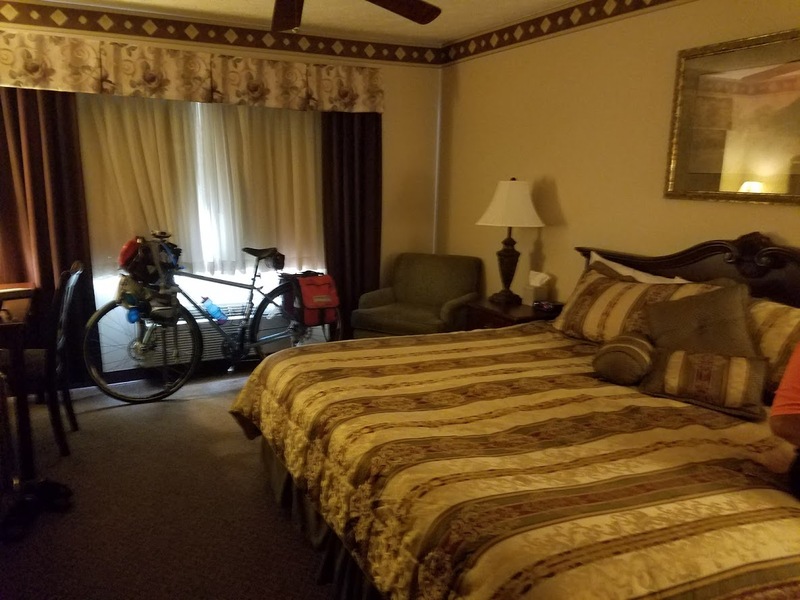 After checking into the hotel and rolling the bikes into the room we rested for a bit, then showered and got ready for a night on the town. Unfortunately, the town rolls up its sidewalks about 8:00 p.m. The info pamphlet in the room listed some quaint eateries. A small place called Beans and Cream peaked our interest because ice cream sounded delectable…and, we got there just as they closed the kitchen. We settled for the diner across from the hotel, The Main Street Station. The staff was friendly, the food was good, but the flies. I wasn’t sure if I was eating dinner, or if I was dinner! All flies aside, we were glad to get a good meal before our last day on the trail. While enjoying the evening breeze on one of the many patio chairs surrounding the Hearthstone Inn we posted a picture of our digs on Facebook. 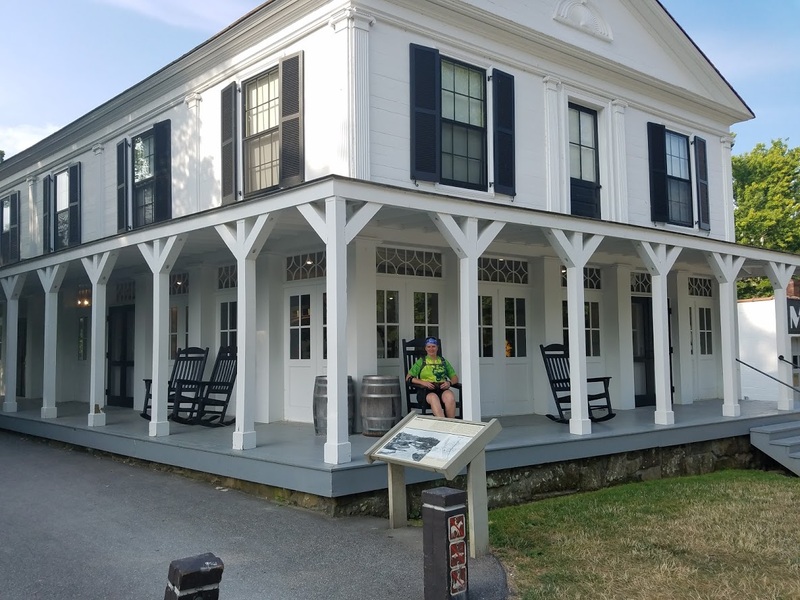 Within 15 minutes Roomie commented that they had a nice two room suite at the Cordle Inn but their host hadn’t come by to collect the fees yet because he was at the dentist tending to a toothache. Unfortunately, the only TV in the place was a nine-inch screen located in one of the bedrooms. At least it was a color TV. Before we the evening set in we decided to walk the mile to a convenient store across the street from Cedarville University. School was not in session so the campus was quiet in the July heat. We returned to retire for the night and watch the final night of the Democratic National Convention. Up early again to get a good head start on the day. Today was a nearly 60-mile day. It was, however, almost all bike trail. To give you some perspective, we had a total of 665 ft. of elevation over the entire course. This was my favorite breakfast of the week, though. I just love the warm cinnamon rolls at Holiday Inn Express. We departed Holiday Inn smarter than we were a day ago for a 2-mile coast down a 2 to 3 % grade into Mt. Vernon. We met up with Pedal Pal and Roomie at the Comfort Inn. Roomie came out first. We waited a while for Pedal. When Pedal arrived, Roomie decided he wanted to go back in to get his Muscle Milk. We were all finally together and crossrd the bridge for day of some downhill, for a change. 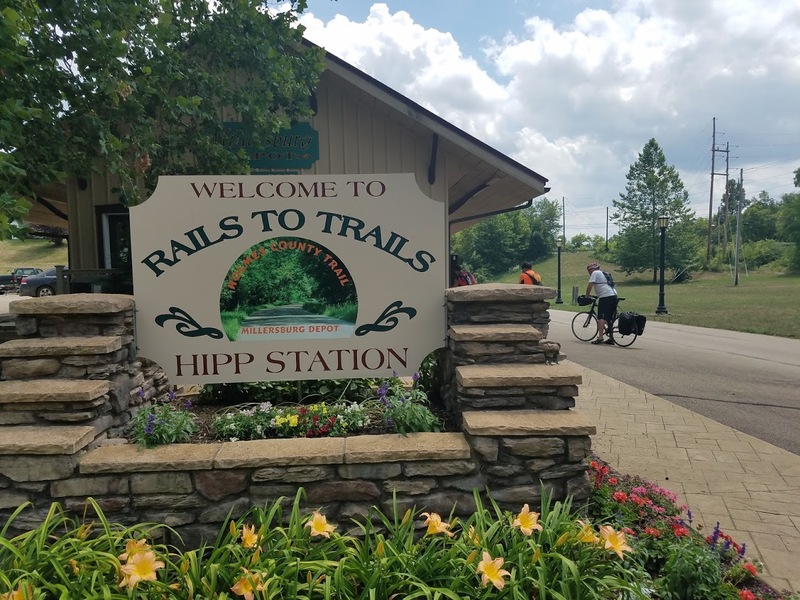 The Heart of Ohio Trail runs the distance from Mt. 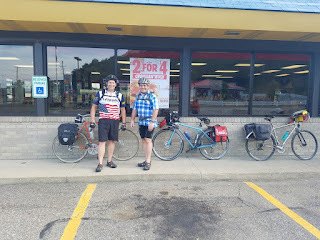 Vernon to Centerburg and starts just outside the Comfort Inn when Pedal and Roomie had spent the night. 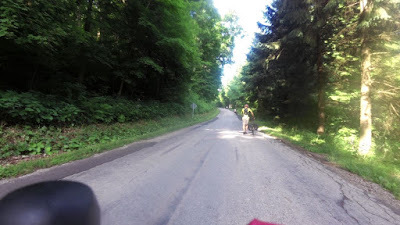 The next 14 miles were a slight uphill grade finally peaking just before Centerburg. 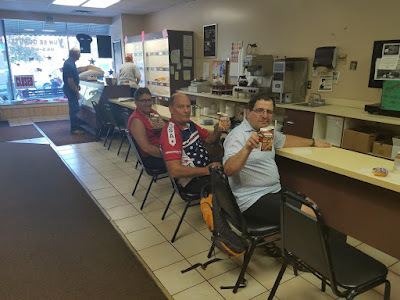 About halfway through the day, about 31 miles into the ride, we all developed a hankering for some fresh, small-town doughnuts and a glass of cold chocolate milk. We found just the spot in Sunbury. The Hoover Scenic Trail circles the reservoir in Sunbury before crossing the pedestrian bridge to the Genoa Trail. 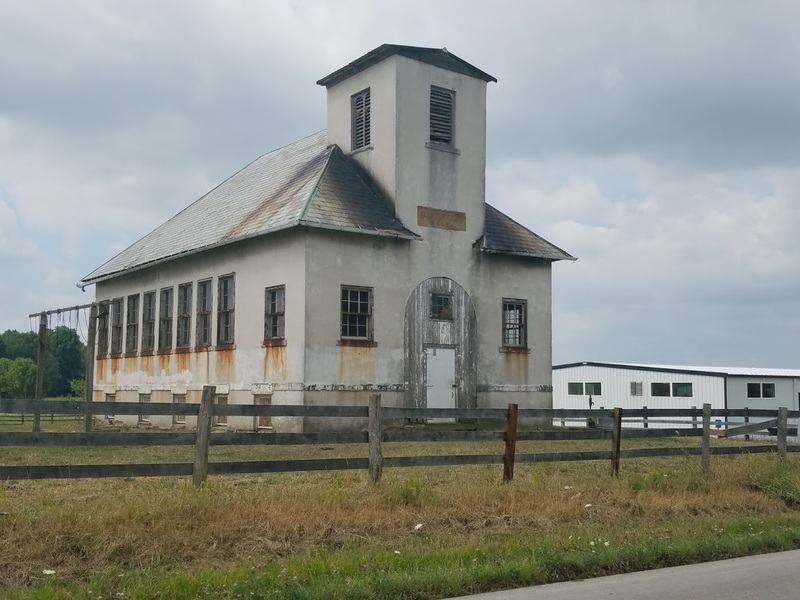 A mile past the doughnut shop was Big Walnut High School, a virtual incubator for female volley ball players, according to Pedal Pal. Pedal has a difficult time leaving his coaching job for vacation so every time we are anywhere near a high school it’s fair game for recruiting. While Pedal was inside wheelin’ and dealin’ Roomie, Velo and I just hung around outside longing for some air conditioning. The day was turning into a scorcher. Another 2.5 miles and we found the town of Galena and the Hoover Scenic Trail. Off the trail for about half a mile and we picked up the Genoa Trail. Those 25 miles were slightly rolling but overall downhill to Westerville. Pedal and Roomie left us at Westerville. Roomie needed a small repair to his bike so they stopped at the LBS. Rumor has it that Pedal’s bike was molested by someone at the store causing a bloody elbow and some chipped paint. 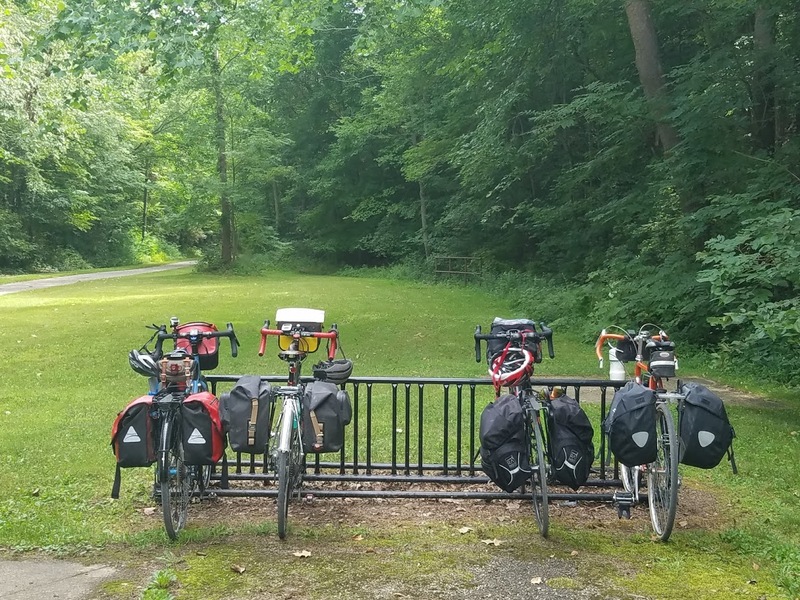 We continued on the Westerville Trail, taking a short pause at the Westerville Depot. After leaving the comfort of trail life we turned west onto Schrock Road. This was not a scenic road, nor was it a fun road. Heavily trafficked by fast moving vehicles, the bike lane was a reprieve, until…the street cleaner was operating in it. What city operated the street cleaner in the afternoon on a busy five-lane highway? Of course it was blocking us just as we came to an uphill grade forcing us to merge with traffic. We were stuck on this hindrance of a road for a bout 5 miles. We passed the big Budweiser factory and turned south again on Proprietors Rd. The road was so short we missed a turn onto North Road. Nothing a quick u-turn couldn’t fix. 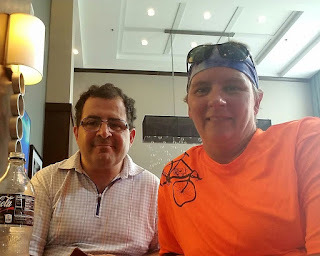 After crossing High St. we found the Olentangy trail, again made a wrong turn, righted ourselves and followed the Olentangy trail all the way to the hotel. That sounds easy, but it was far from it. The roadways in and around the university are hectic to say the least. Add a soccer tournament and a Nick Jonas/Demi Lovato concert to the mix and you have pure insanity. Velo and I were on our own for 16 more miles to the Ohio State University in Columbus. We were so thankful to get to our hotel. The thought of checking in, drying off, and relaxing a little before dinner was encouraging. No go. Sixty miles in 90 degrees terminating in heavy rain and the hotel was sold out. We would have to wait in the lobby until our room was ready. We have been suffering terribly from lack of riding, both VeloJunkie and I. Today was supposed to be another day sacrificed to working on the old house. We waited and waited but the delivery truck was a no-show. Finally, at about 3:00 p.m. we decided to take advantage of Home Depot’s mishap, the beautiful weather, and the duration of sunlight we still had in October, and go for a ride. We hadn’t eaten lunch yet so we determined our destination by our cravings. Eli’s barbecue it was. We resolved we would pick up Eli’s on the way to Bad Tom’s Taproom and have a couple of choice brews with our smoked meat. We should have recognized the inklings of disorder all along our route and throughout the day. First, of course, was the miscommunication about the delivery. Then there was a strong wind out of the south and temperatures were higher than normal for an autumn day in the middle of October. Drivers were impatient, even other cyclists didn’t return a friendly wave or nod in passing. Soon I realized I had left my phone at the old house so I was travelling completely disconnected. Eli’s, usually the busiest place in town, had only a handful of patrons under the big outdoor tent and no one dining inside. We ordered our food and waited outside. It was presented to us in two large, carry-out trays instead of the individual containers they used to put orders in. Baked beans and cole slaw travel much better in sealed bowls than separated trays. 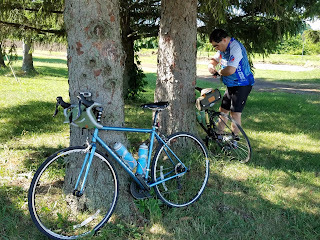 We finally figured out how to secure the food on Velo’s bike and pedaled very slowly to Bad Tom’s, me trailing Velo to make sure the food didn’t slip or spill. We ordered our beer, a Bad Tom Brown Ale for me and an American Outlaw Pale Ale for Velo, and took a seat at the table nearest the turntable. A woman comparable in age to us was spinning vinyl on the old RCA and singing along with the 70’s music. Three Dog Night, then CSN, a little bit of Led Zeppelin, then some Eagles. We talked to her a little about star signs, zodiacs, and album covers, lamenting the fact that nobody cared about the art on the cover anymore. Remember the cover of “Desperado” or “Black Sabbath”? We opened the containers that we so precariously transported only to find them void of utensils. The sandwiches were easy but we had to reach back deep into our medieval ancestry to figure out how to eat the beans and slaw. After two beers each we decided it was time to go. Daylight doesn’t last very long this time of year and our route home passes through some less desirable parts of the city. 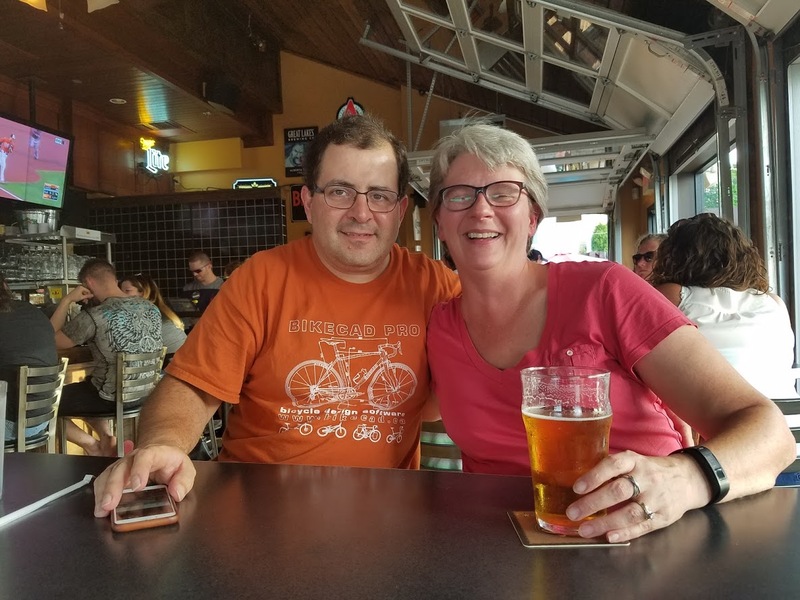 Velo just couldn’t leave the area without stopping at his favorite taproom, Blank Slate, for just one more. By the time we left for home the sun was low in the west and we had about 13 miles to put behind us. I was pedaling pretty hard when we came to a stoplight. 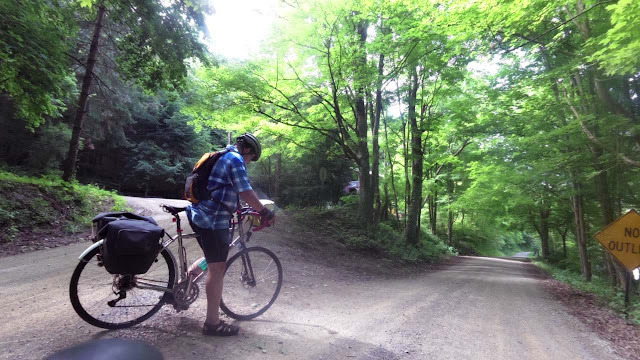 I looked at Velo and warned him that something had to give…I was going to either burp or vomit if I had to climb one more hill with a belly full of beer and barbecue. We made it to Riverside drive free and clear, still moving fast but no elevation for a while. Much to our surprise we were soon facing an onslaught of costumed motorcyclists. There must have been 200 or more roaring down the street in their Halloween best. It was a sight to behold and I so wished I would have brought my camera. Chances are their images would not have shown up in pictures anyway. All the time the sun was waning faster than we were riding. 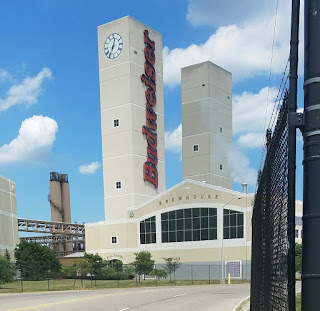 We got into the industrial part of the ride just as dusk was bearing down. This part of town is pretty desolate on a Saturday, and by the time evening rolls around there is not a living soul around. I was stopped at an intersection, underneath the flickering of a streetlight, when Velo rolled up next to me. Looking over at him in the strobe of the lamp I couldn’t help but think that we must be in some sort of underworld. I laughed and said “Hello Vampire Bait”. Velo didn’t laugh. 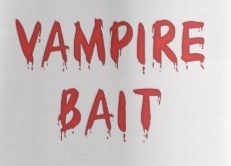 "Vampire Bait?" He looked at me quizzically. I said "Well yeah. Your heart rate is up, your blood is pumping, what more could a vampire want?" We made it home just before nightfall, exhausted from riding full throttle for the last two to three miles. Day three of riding was another short day. Sometimes, when planning these long bicycle trips, you are constrained by where the towns fall on the map and just have to accept the spaces therein. Just like you are subject to the geography of the route. Which brings me to my next point of conversation, even more significant hills than day 2. The cartographer of this map should feel lucky to be anonymous. I woke up with a stiff neck from sleeping on a pillow that felt like it was made of hard rubber. Two Advil and a swig of Orange Crush did the trick. What goes up must come down and so we started the day rolling back downhill to the Holmes County Trail. 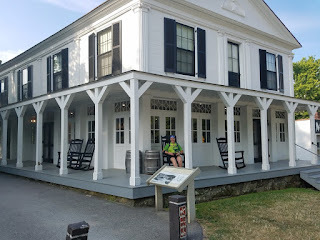 The Hotel at Millersburg does not have breakfast so we left our lodging, four hungry ramblers in search of grub. About a quarter mile down the hill we could smell the sweet aroma of fast-food breakfast. There it was, Burger King. But wait! It didn’t appear to be open. 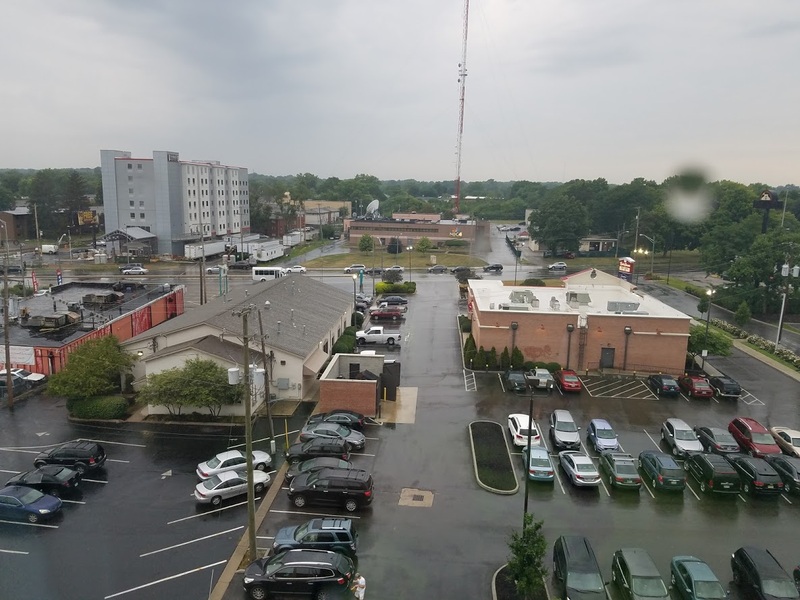 The parking lot was void of cars and the tinted windows made the interior seem dim. Upon closer examination there were angels from heaven in Burger King uniforms busy with the grilling sausages and making coffee. Velojunkie and I reached the front doors first. 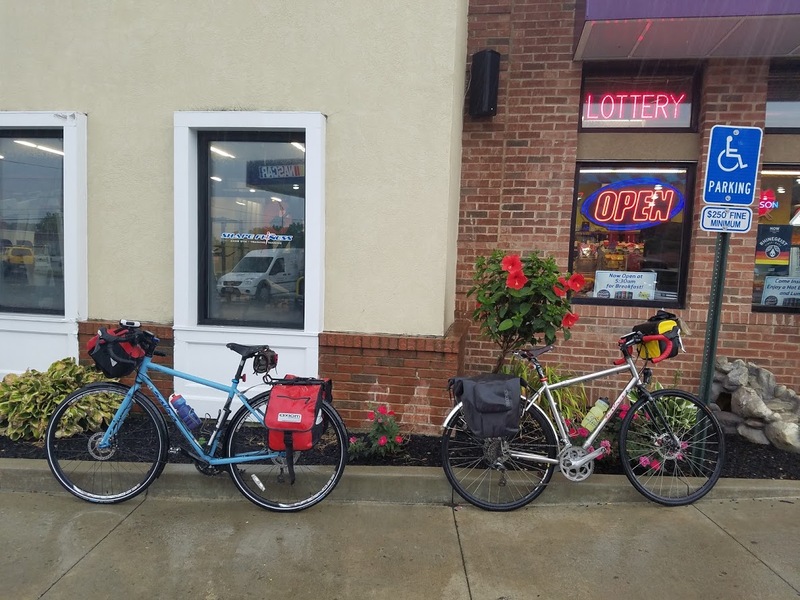 We dismounted our bikes and properly rested them against the side of the restaurant. After ordering our food we selected a table and waited for Pedal Pal and Roomie. And we waited. And we waited. We assumed a flat tire and started satisfying our need for caffeine and calories. A few minutes later our comrades pulled up. Roomie had suffered a slight mishap when he tried to clip in only to find his cleat was missing. The force of his foot slipping off the pedal threw him off balance and down he went…on his elbow…in the gravel. Again, angels were with us as Pedal had a spare cleat and Velo had a cleat tool. Who does that? Of course Burger King was void of any fruit for breakfast and Roomie desperately wanted a banana or two to replenish his potassium so we stopped at WalMart. This was convenient because the Holmes County Trail started back up at the edge of the parking lot. 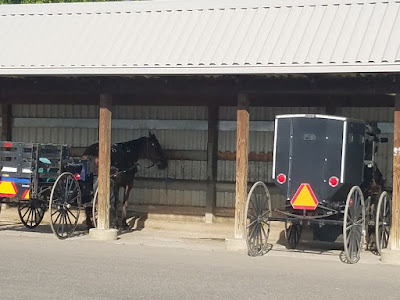 This is by design because it is a carriage trail for the Amish as much as it is a bike path. 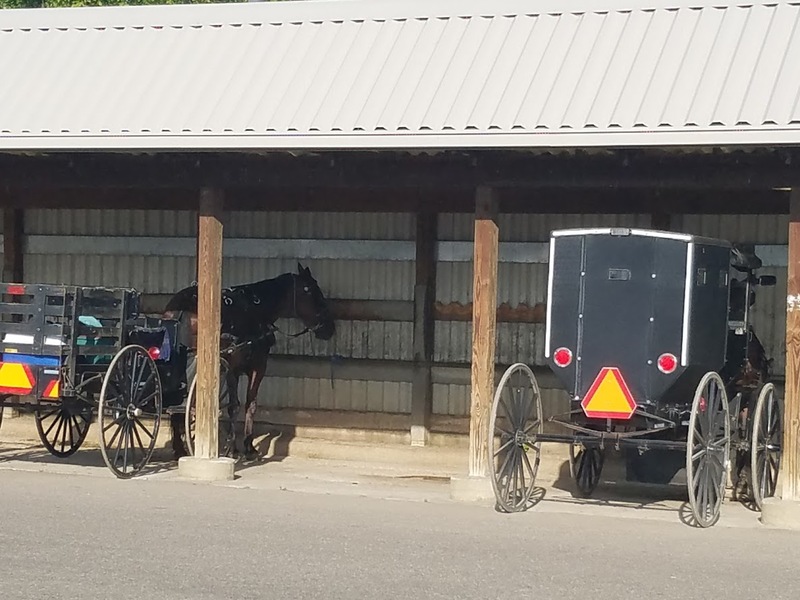 There were even some buggies parked in the Buggy Barn, constructed specifically for those that arrive by horse and buggy. Then there’s that. Can someone please explain why a culture can’t travel by car but can shop at WalMart? 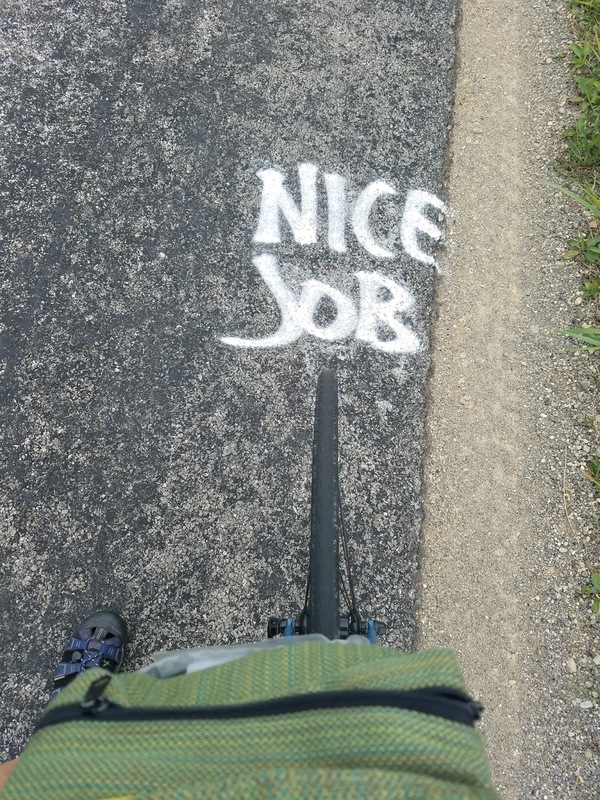 We enjoyed the smooth and flat trail for about seven miles. Of which Pedal and Roomie rode on ahead at a faster pace. We left the trail for OH 520, the part of Bike Rte. 1 that passes through Killbuck. But the real drama started when we turned onto Hwy. 6. Hills started at about mile 8 and continued up for the next five miles with grades up to 10 and 12%. It wasn’t long before we were all four struggling up the hills together. The exaggerated elevation variations went on for the next two miles; each climb more disheartening than the last. Even Velo had to dismount and walk at one point when a steep climb had a false crest, only to make a sharp turn and continue up. Hwy. 6 turned into OH 25 and, just when you thought it was safe… BAM… more monster hills. Finally, a long, curvy, downhill coast on US 62. The caveat, this is a US route instead of a state route. That can only mean one thing – big trucks share this road. And they were big, and very fast. And very scary. 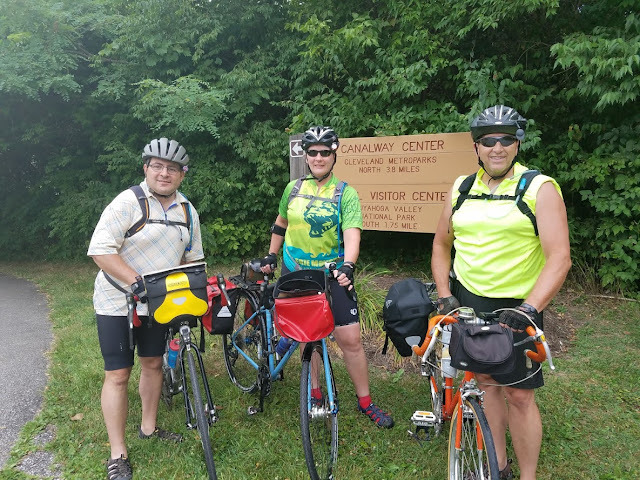 We were finally able to exit US 62 for the Mohican Valley Trail. We took a break by the “Bridge of Dreams”; no doubt we were dreaming of a smooth, uninhibited downhill coast. It wasn’t downhill, but it was a nice, flat, relaxing ride on the Mohican Valley trail. We arrived into Danville hot and hungry. Of the two restaurants in the town we chose “The Bender” for the daily special – BLT and fries for $5. 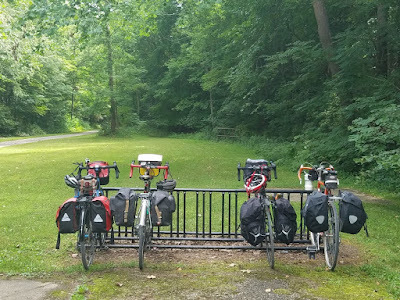 On the outskirts of Danville we picked up the Kokosing Gap Trail. With four miles or so to go to the Holiday Inn, we left the trail. I gasped at the hills through Gambier, but I struggled through. Gambier is the home of the prestigious and beautiful Kenyon College. The scenery throughout the campus was enjoyable enough to forgive the 8 to 10% climb. I cried at the last hill, another 10% grade. My legs were spent. Cars were coming up behind me and there was little to no berm on Upper Gilchrist Rd. I made the decision to walk to the top and then ride the last block to the Holiday Inn. Pedal and Roomie decided to stay in the center of Mt Vernon and avoided the hill to the Holiday Inn, so it was just Velo and I for dinner. We chose Bob Evans, an Ohio favorite for a hearty meal, because it was in walking distance. Rising early to get a head start on the mercury, we embarked on the Hampton Inn free breakfast as soon as it was available. This time Pedal Pal was legit, as was our newest comrade, Roomie. Starting early had little impact on the time we checked out, though. I think we lingered at breakfast absorbing as much protein as we could for the impending “significant hills”. The Ohio-to-Erie map folks were kind enough to warn of upcoming elevation, albeit with little detail as to what “significant” truly meant. Upon leaving the Hampton Inn in Massillon we had no idea one of those hills would hit us smack in the face within a quarter of a mile. Now, I don’t know about you, but my cardio-pulmonary combo likes to have an easy several miles to get into a rhythm with each other. The lungs need about 30 minutes to calibrate the O2 gauge so the heart doesn’t over exert due to insufficient flow of oxygen. Pedal and Roomie bolted ahead of Velo and me. I guess I am more like the tortoise than the hare. Slow and steady, seldom sprinting. I assume all of you who ride with any frequency are pretty in-tune with your metabolism and fuel requirements. I am as well and know that in addition to proteins and fats I need some good ole’ carbs for breakfast. Shortly after getting on the trail after conquering the hill I realized I was sorely lacking easily convertible energy. The only thing I had with me that constituted pure sugar was an envelope of instant hot cocoa powder. I laughed when Velo had taken it from our hotel room but I guess he had more foresight than I. So there I was, on the side of the Sippo Valley Trail, pouring cocoa powder in my mouth and waiting for the shot of energy. Just and FYI…it worked really well. The Sippo Valley Trail is a flat path that meanders through a quiet, residential neighborhoods and several park-like wooded areas for about 12 miles. Velo and I enjoyed our coast on the trail until we had to leave the comfort of the known terrain for the uncertainty of Bike Route 1. The majority of the significant hills for day 2 were in the stretch between Dalton (pronounced Dow-ton) and Fredericksburg. At one point we even came across Pedal and Roomie sitting on the side of the road recovering. 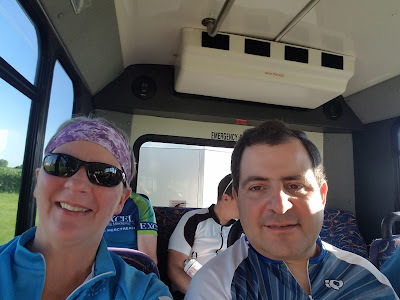 The extreme elevation changes only lasted for about fifteen miles, but those were fifteen demoralizing miles that showed us what we were made of. 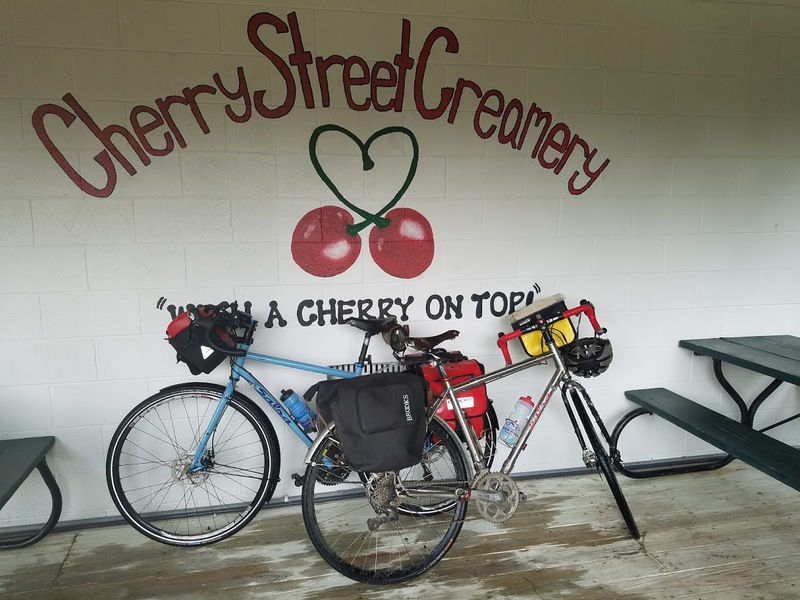 The struggle ended wtih a mile and a half downhill coast into Fredericksburg where we found Lem’s, a small, independent business in the land of the Amish, serving up hearty subs and cold soft-serve. Out of about 15 different favors of ice cream I chose cheesecake. Velo selected butter pecan. We sat at the outside picnic tables for a good, long time enjoying the quietness of the small town and resting our bones. Our gluteus and calf muscles were like rubber bands, our clothes wet and our skin salty from the exertion. The hills were behind us and only ten miles lay between Lem’s and our destination for the night. The Holmes County Trail took us all the way to Millersburg, home of the Hotel at Millersburg. We stopped at the depot to get directions to the hotel only to find out it was at the top of a hill. As a matter of fact, the whole town was set at the top of that hill. Nope. I refused. I made it to town by the power of the pedal, I refused to pedal anymore, or at least not up a hill. I walked my bike up that hill with as much indignation as those struggling to pedal. The Hotel at Millersburg was very nice. They had a courtyard to park the bikes in until the party room was empty. Then we could lock the bikes up inside for the night. We had spotted the Millersburg Brewery across the street and were excited for a local craft beer. You can imagine our disappointment when we found out they weren’t open on Tuesday. WHAT?! “Bags” was the sports bar next door and luckily had one of the local brews on draught. The spinach salad, chicken wings, and peanut butter cheesecake filled the bill and we were ready for a good nights’ sleep. The 1000+ ft. of climbing in less than 15 miles made a short, 38-mile day quite exhausting. In summary – Massillon to Millersburg is a short, 38 mile ride with bike trails on either end. The mid-section has some steep climbs and exhilarating downhills. The elevation gain in the middle certainly makes up for the brevity of the route. 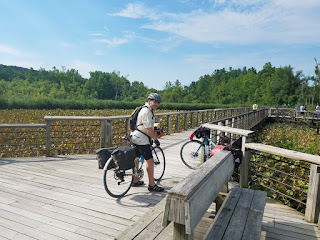 Stay tuned for more adventures of riding the Ohio-to-Erie trail with me, The Reluctant Cyclist, Velojunkie, Pedal Pal, and Roomie. This trip had been a long time in the making. It seemed whenever we tried to plan it we ran into some sort of obstacle. Finally, the day arrived and we were ready to head north. We pulled up to Pedal’s house, startling his wife, Trekkie, when we blew the horn at her as she was walking their beagle. In her state of frenzy, she scooped up poor Mazzy, who in turn started bellowing in her native hound dog bark. Bikes and bags loaded, we left Cincinnati by 8:00 a.m. and made our destination by 1:00 p.m. After watching Pedal haggle with the hotel host at the Springhill Suites, (his room wasn’t ready at the Red Roof Inn), soaking in the hot tub and indulging in a blissful nap we walked across the street to the “Winking Lizard”. A keen view of downtown Cleveland and great selection of local ales and soon the joint prophetically became the “Linking Wizard”, or the “Leaking Gizzard”, or… well, I think you get the idea. By the time we left the Lizard the once empty parking lot had filled completely with a picnicking group of Jehovah’s Witnesses. It’s a good thing they don’t party late into the night because we wanted to hit the road early. 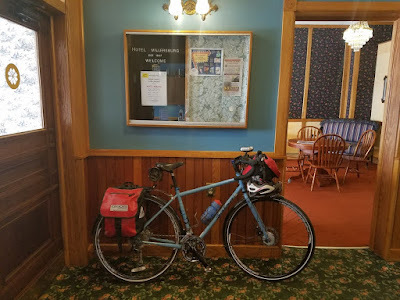 Day 1 of riding – We smuggled Pedal in through the backdoor of the Springhill Suites for the free breakfast at 7 while hiding his bike in our room. He moved like an amorphous creature through the breakfast line so as not to be recognized. The ride to the trail head was easy breezy on a Sunday morning, even though the road was typically a busy thoroughfare. After posing for a group picture we rode south to the Boston Store, an historic post for textiles, flour, and feed. The skies to the west were darkening but we were optimistically hopeful the storms would miss us. Can I say “Hope is not a plan of action”. The trail had been detoured in more than one If looks could kill! But each time my instincts were correct and we would have to turn around. Velo would concede, Pedal would laugh, and I would humbly gloat. Just south of Peninsula is a nature preserve called Beaver Refuge. Although much of the life there is under the abundant lily pads and other water flora, there was still a turtle and a couple of birds enjoying the creature comforts of the protected area. The route into Akron was demoralizing. A network of narrow ramps, each being of 5% grade, then a detour through a deserted downtown, followed by a winding course though several neighborhoods culminating with a temporary, floating boardwalk over a swamp. Something large and invisible was leaping out of the water as the platform moved under our feet. Soon after leaving the boundaries of the city the skies opened up. I believe we were in the center of the thunderhead. Our only option was to carry on. Our tires sank in the wet, sandy, crushed-stone trail as tiny frogs hopped across in front of us. I was stopped at a crossroads in the blinding rain, the sound of the railroad gates melancholy against the bright lightening and loud thunder claps. I felt as if I were in some Alfred Hitchcock film waiting for the climatic end. Pausing in Canal Fulton to get out of the rain, we stopped at the Cherry Street Creamery. A burger and milkshake was the perfect menu for a group of soggy cyclists. The still canal was emerald green along the trail. Periodically a Great Blue Heron would be on a limb, watching us with one eye while searching the canal for a meal. Or a gaggle of Canada Geese could be seen socializing amidst the bounty of natural food. We made it to Massillon in the late afternoon. Pedal, a college volleyball coach in the fall, turned and headed straight for the rec center where a tournament was being hosted. He was going to try his hand at recruiting despite the wet clothes and the mud caked to his shoes and legs. Velo and I checked into the hotel to get cleaned up and ready for dinner. Oddly, the first four levels of the hotel were a parking garage so we decided to walk the bikes up the ramps. 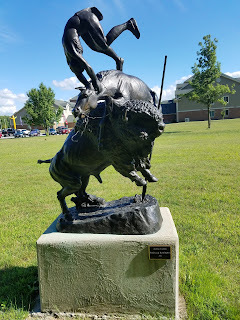 Massillon is where we met up with the fourth rider, Roomie. Roomie had been Pedal’s roommate in college and had also been trying to ride the Ohio-to-Erie trail for a while. He jumped at the chance to ride with his old pal. 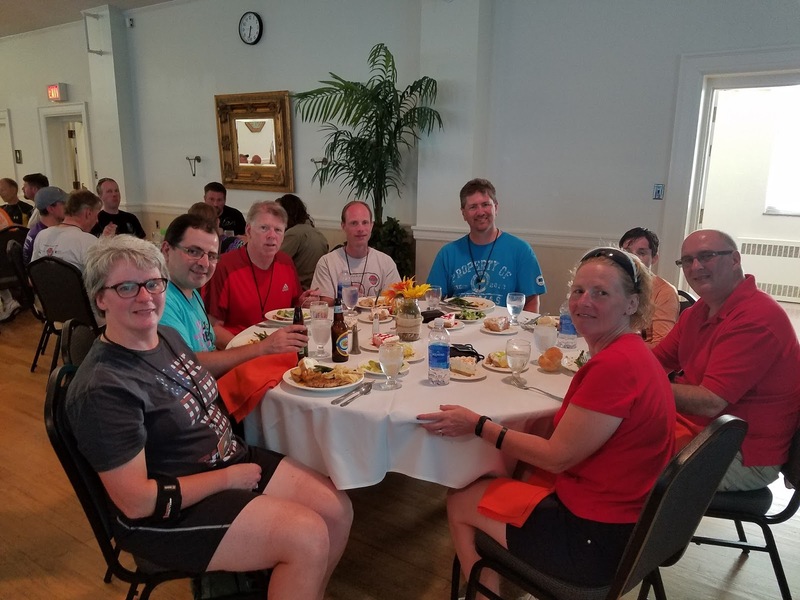 Dinner at Rockne’s Irish Pub provided sufficient fodder to relax and refuel before a rejuvenating sleep at the Hampton Inn. Watch for Days 2 through 7 to be posted shortly. Let me preface this story with the reason I registered for the Young’s Dairy Charity Ride. Every year Young’s Jersey Dairy in Yellow Springs, OH hosts a bicycle ride to benefit four different charities – Juvenile Diabetes Research Foundation, United Rehabilitation Services of Greater Dayton, South Community Positive Health Options, and, the reason I chose this ride, Alzheimer’s Association. Last year, on this very weekend, my mother entered the hospital for the last time, as noted by my sister on my FB post. She passed away before month’s end. Like many older adults she suffered dementia and confusion. Unfortunately, society accepts these maladies as a normal part of aging. The Alzheimer’s Association wants to change that. Their mission: To eliminate Alzheimer's disease through the advancement of research; to provide and enhance care and support for all affected; and to reduce the risk of dementia through the promotion of brain health. As you can imagine, my emotions were affecting my attitude, though not outwardly visible. Last year I was on the last day of a week-long ride when my sister called with the news . I felt helpless. I was hundreds of miles away in a remote area of Michigan’s UP, on a bike. It was 60 miles to the car, then a ten-hour drive home. 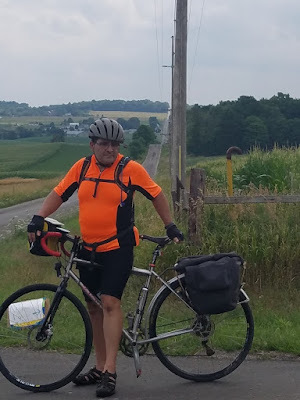 This year I was determined to find a ride that raised money for the Alzheimer’s Association and I would travel as far as I had to in order to participate. Wouldn’t you know there was one just a few counties away? The ride started early so Velojunkie and I had to set the alarm for 4:30 a.m. With five dogs, two cats, and two goldfish to tend to, getting bikes and bags loaded can be tumultuous at times. We made it to the ride in plenty of time. With the bikes off the car, I started assembling all the gadgets I use for riding and blogging – bike bag, camera, computer, water bottles, etc. First oops! 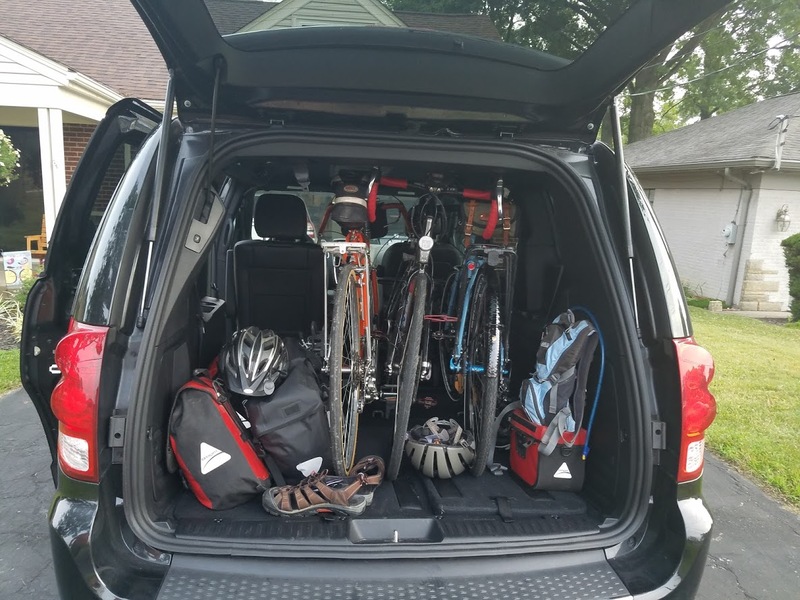 of the ride – I couldn’t find my bike computer. I knew I had it but it wasn’t where I swore I had put it. I looked everywhere and finally checked the first place a second time. Eureka! It was right where I thought it was. How did I miss that? We walked our bikes across the highway to the start. That was a mistake because, had I ridden to the start I would have discovered that, by some unknown rhyme or reason, my saddle had been moved, the angle changed significantly. Unfortunately, I didn’t discover it until I jumped into the ride. I refused to stop to adjust it, that would have put us lagging behind all the other riders. I figured I could make it to the first rest stop and make adjustments there. The longer I rode the more defined the maladjustment became. This was a saddle that I had been riding for over a year. I had it perfectly adjusted for my comfort. It should have by no means been touched. 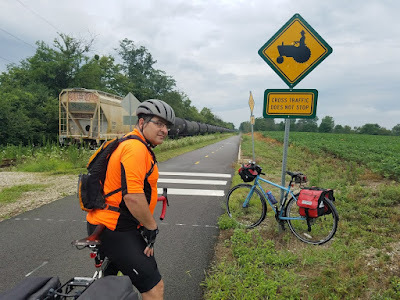 I may never know who or what moved it, but I was getting angrier and angrier, and each mile was getting longer and longer as I attempted to find a comfortable position for pedaling. My emotions were on edge anyway so I had to direct my displeasure at someone, and poor Velo was the only soul by my side. I took solace in the fact that the weather was superb for riding. The humidity had all but disappeared and the temperatures stayed below 80 for most of the day. 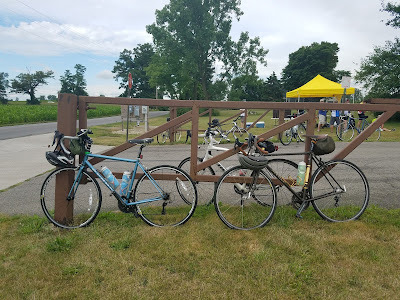 All of the rest stops were sufficiently stocked with grapes, strawberries, cookies, corn chips, trail mix, and more. Something salty, something sweet, and something cold to drink. First stop, adjust the seat. Ride a little way, better but still not right. Frustration. Feeling some pain now. Who the hell touched my saddle?! Second stop, adjust the seat. Ride a little way. Better but still not right. Becoming more painful. This was supposed to be an awesome ride and a test of fortitude. But, because someone jacked up my seat, it had become an exercise in endurance accompanied by implements of torture. At the next stop Velo thought maybe my seat needed to be moved back a little farther. He thought it looked like it was up as far as it could go and thought that might help. God love him, he tried. Now the tendinitis in my elbow started to flare because I was extending to reach the handlebars more. And sitting was still painful. I know. You’re wondering why I am smiling in all of the pictures when it seems the cards are always stacked against me. We all know that “the worst day on a bike is still better than the best day at work”, right? We made it to the lunch stop, a succulent array of pasta, pulled pork, salad and cheese curds. Bussing it from the lunch stop to skip the last 23 miles of the route was one of the ride options and my insufficient training and tendonitis had convinced me this was the distance I should pursue. The bus was waiting for the 60 mile riders so Velo and I took our seat for a short jaunt to the next rest stop. Our driver, Don, turned one way only to find the bridge was out, then he turned the other way for the detour only to come across a mobile home that had come off its trailer. Luckily the bus and bike-trailer were able to get past the calamity, but, because of the detours, Don was forced to drive the same route as the cyclists. 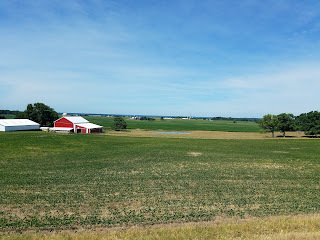 I enjoyed my nap on the slow bus ride and felt refreshed when we reached the last rest stop, just 7 miles from the end. I decided I rested enough to finish the route on my bike for a total ride distance of 65 miles. rooms to lodge in, free ice cream from Young’s Dairy in a variety of top flavors, cold beer for a minimal donation, nice walking trails decorated by replicas of Remington’s famous sculptures, (full of PokeStops, too), and a banquet dinner in the ballroom. I was exhausted from the early morning rising and the long ride that I was having difficulty keeping my eyes open at the dinner table. The dorms were very spacious. Not what I remembered from my college days. Velo and I had our own dorm equipped with a kitchen, a private bath, and two bedrooms. Each room had a twin size bunk in it furnished with clean sheets and a blanket. All I cared about was that it was soft and clean so it met my requirements perfectly. Velo’s bunk, for some reason, was about four feet off the ground. Velo, if you don’t know, is not a tall dude by any stretch of the imagination. He is also not very bendable so observing him climb into his bunk was my night’s entertainment. Day two was starting out hot. We were served breakfast in the cafeteria with the cheer leading camp. Don’t get excited – these were all 8 to 14-year-old cheerleaders. I had already determined we were going to take the optional bus ride for the 25-mile move-ahead. The bus was full this time; I guess a lot of folks wanted to try to get finished before the sun was high and the heat got unbearable. I had yet to get my seat correct and was just about to throw in the towel. This ride was supposed to be meaningful and dedicated to my late mom. But I had to keep tweaking my seat to the point of discouragement. About halfway through day-2 I may have finally gotten my seat adjusted. 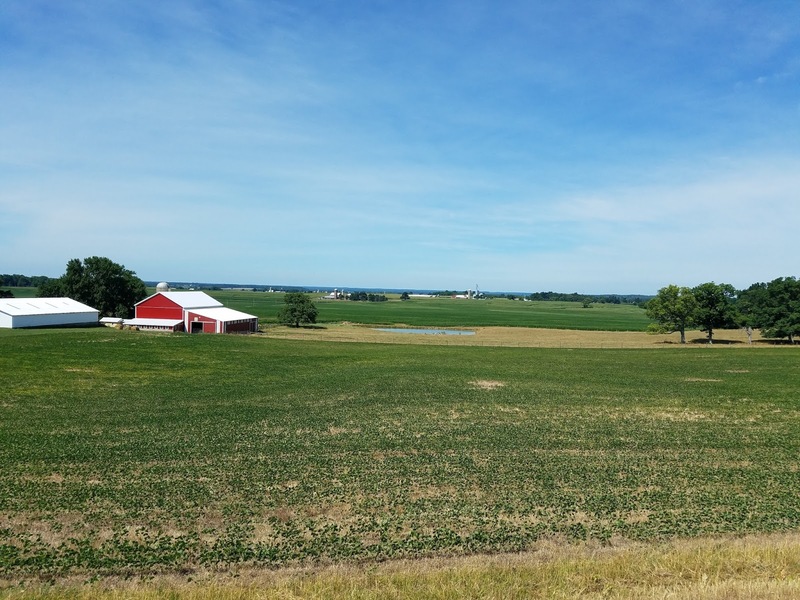 The route, though a little different, was a lot more of the same, vast corn fields, typical northern Ohio farms dotted with livestock and churches, and long county roads. After 60 miles in the heat and sun I was soooo glad to reach the finish-line celebration and the car. 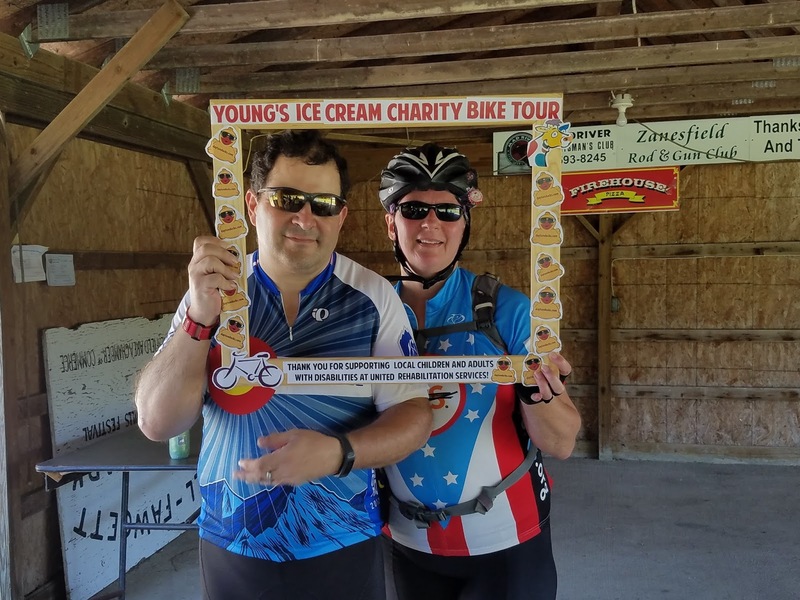 If you want to see how a charity ride should be done, come join us on the Young’s Dairy Ride in 2017. Thank you to all who donated to the cause. You Rock!! !